Two years ago, he was moved from wide receiver to safety and Dallas took a chance on drafting J.J. Wilcox. Dallas drafted Wilcox with their third round pick, the 80th overall selection in the 2013 NFL Draft. James Edward Wilcox Jr. was born on February 14, 1991 in Cairo, Georgia. JJ attended Georgia Southern University where he played as a wide receiver until his senior year when he was moved to the safety position. Wilcox had his struggles last season that began with the passing of his mother. Wilcox returned to the squad after dealing with his loss. His time away from the team arrested his progression into the Cowboys’ system. Skeptics and fans alike were calling for J.J.’s job last season but Jason Garrett stayed with the feisty safety, allowing him time and room to grow into the position. Wilcox came into the league as a raw talent. The Cowboys liked his physical style of play and projected him to compete for a starting spot next to fellow safety Barry Church. Wilcox has been physically durable. He has a hardnosed style that has caused him to miss a couple of tackles, but for the most part he is an asset to the Cowboys’ secondary. Wilcox is more than willing to lower the boom on opposing ball carriers, making them hear footsteps when they attempt to run routes in the middle of the field. This season, Wilcox, as I predicted in my preseason previews, he has fulfilled his expected learning curve and has come on to be a stable part of this defense. Wilcox’s play in week 15 against the Philadelphia Eagles was his most impactful performance of his young career. He has two interceptions on the season and he had a forced fumble against the Eagles that killed their momentum, changing the course of the game and impacting the entire team. 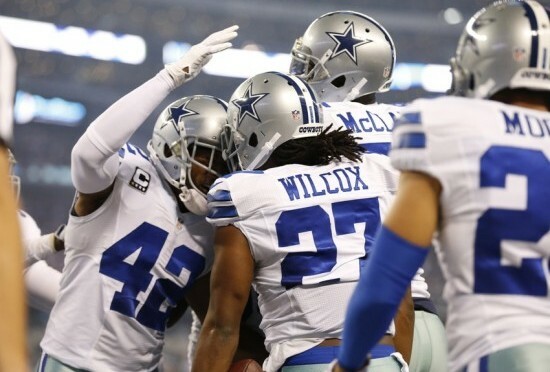 Wilcox currently ranks third on the team in tackles behind fellow safety Barry Church and middle linebacker Rolando McClain. Wilcox has made the front office look good for sticking with the 23 year old from Georgia.